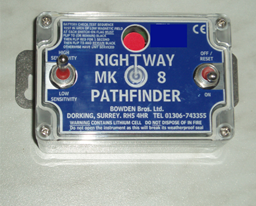 The highly successful portable MK8 Pathfinder is used as a linesman or fault repair team’s tool to localize either an earth fault, or a phase to phase fault on an 11 or 33KV overhead line The Portable FPI can be strapped to a clean pole at eye level and after re-energising the line, will tell the operator whether the fault is beyond that pole. With a number of units, a sometimes hard to find fault can be pin pointed very quickly. The MK8 is powered by a long life Lithium battery which will give at least an 8 year life under normal operating conditions. A battery test facility is built into the switch on routine. Portable engineer’s tool that is carried in his van and used on any fault for which he is called out. Can be moved to different locations to pin-point the location of the fault very accurately. Variable sensitivity control gives an increased response to low fault current where fault levels are low. Supplied with pole strap and hard ABS case for three MK8 units. Sealed enclosure for environmental protection. Can be left out on the network to locate re-occuring transient faults.